While waiting for the plumber to show up (or before fixing it yourself), you might pass the time staring at the drop stretching away from the faucet. Exactly what is happening? It seems pretty clear that the bottom part stretches and pulls away, and gravity that separates distends and pulls the drop away. But as the little neck of fluid separating the water at the faucet head from the drop stretches, what exactly happens? 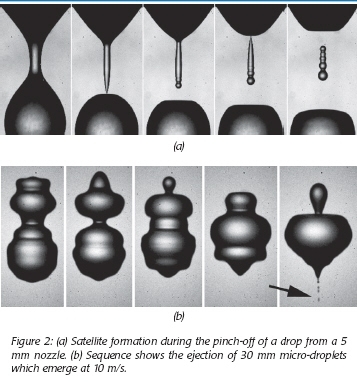 In fact, microbubbles can be so small that gravity is not really the key effect in the splitting of a tube. Instead, it is the key role of surface tension and curvature that causes the bubble to break, similar to what is showing in the dynamics of inkjet plotters. Zooming In: What happens at the pinch off point? We will look at potential flow for water inside the fluid tube, and air outside of it. To make life easier, we will assume that the structure is periodic: you are just looking at one piece of a structure of a fluid tube that repeats itself. Surface tension, which is proportional to curvature, is what makes this tube pinch off in the middle. Here, it is mean curvature which matters. We interested in devising a numerical method which can pass through the pinch off (change topology), and keep going. And once that pinch off happens, surface capillary waves create wild oscillations. How will we solve this? A Level Set Method will allow us to track this boundary of this fluid tube as it moves, all the way through pinch off and beyond. We embed the interface, as well as the velocity and the potential function, all in a higher dimensional implicit framework, and solve the resulting system of equations in a time-stepping procedure. The resulting numerical method smoothly tracks the evolution of a fluid tube as it pinches off. The results are unchanged under numerical convergence studies, and match the scaling exponents for asymptotic studies for self-similar pinch. Start with the interface and potential function on the mesh. Use this nodal representation, and pass it to a boundary integral method which finds the potential and the velocity using a fast multipole method. Take the velocity and the potential change, and extend to the computational mesh. Update the level set function using this velocity, as well as the potential evolution equation. This is done in an axisymmetric formulation, with no axial centerline, hence the topological split occurs naturally.